An abundance of love and light! I have another information to share. So know that Henry VIII, who executed his wife Anne Boleyn on 19th May 1536, rests in ???? Saint Georges’ Chapel in Windsor!!! I do not want to be in her position honestly. I wish i could talk to you personally,because i believe we lots to share,but if i may…On other blogs some claim that all this was draw FD out and that she now knows she’s FD…any thoughts? Anne Boleyn rest in the Church of St Peter Ad Vincula in the Tower of London – not st Georges Chapel Windsor. 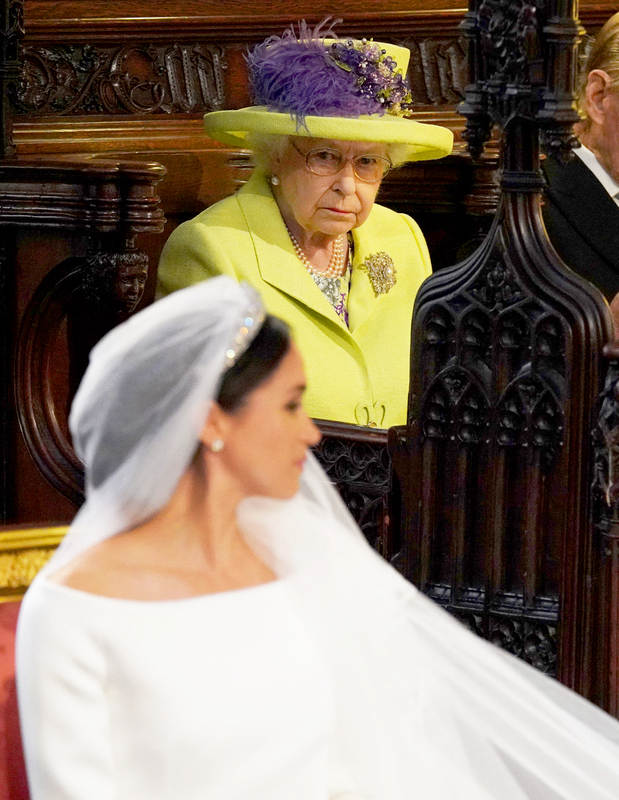 I would like to share with you this picture of the Queen looking at the bride MM. Oh Esmeralda that look is priceless.Its clear no one likes her,though the her fans keep attacking people for that. At the church whilst making their vows no-one from the family looked at them..jaws where dropping and people were amused. I think FD is for Future Duchess. It is Harry’s decision and he will understand it in a few years with experience. Thank you for your insights.there are blogs already discussing that Meghan has secrete’s and that this marraige will ruin her. I surely hope this ends soon. I don’t think this woman is very honest. But, as I said, The Royals who are in Masonic symbolism, occultism, and magic, won’t be nice to her… I don’t think they are very happy with Prince Harry’s choice and this woman. The Queen and other members of the family are tough. The Royals are called the Firm for a reason. But Harry’ s mother spirit is behind him to protect him. The are some possibility for a second marriage with the real FD? I just can not believe he made this wrong choice. MM is receiving everything that was destined for the right girl, this is sad and vile. I believe in real love and this wedding was not about love. The wedding took place on the 19th of May which was Anne Boleyn’s day of execution… I know that the Royals are in the occult and very esoteric… (I don’ t think that is a good sign neither). The Royals won’t be nice to her. Everything happens for a reason. Yes the free will can delay things or change path temporarily but the fate won’t change… As I said it before, Prince harry needs this lesson that will be a harsh one for him but very good at the end. He really loves her but it will be difficult. The wedding was beautiful and certainly different to how the Royals usually do things. Could this be a start of new things to come? I also felt a sadness for Harry as if he was missing his mum, that face expression of a little boy. I really do wish them the best for the future. Esmeralda what did you mean when you said the royals wont be nice to her? and why was this union orchestrated, I mean what happened before? I wish them happiness & that their deep love for each other conquers every obstacle life may throw at them. God Bless Them Always & allow them to ccomplish great things that will benefit the world making it a better place. I’m not psychic, but like all of us, I get inklings at times of what is to come in the near future. From everything I have ever read and studied about predicting the future, I’ve learned that free will is paramount in determining what any person will do in their own lives. With that being said, how can anyone ever truly know what will happen in anyone’s marriage or life in general? There are just too many alternative futures based on the free will of the individuals living their lives at any given moment to know what their lives will be like five or ten years down the road. It seems like a nearly impossible task, even for a an extremely accurate psychic because of any individuals free will. I know nothing of Prince Harry or Meghan Markle, but I do know that whatever they do with their marriage cannot be known 100% by any of us. I agree with you 100%. The things predicted changes based on free will and the choices made. However there is something else going on here. They are twinflames and the vibrational frequency these two generate as a result of their union is a gift from the universe to the world. Everyone who witnessed this union, albeit in realtime or via technology, and who were not hellbent on wallowing in low vibrational frequencies of hate, fear, guilt, shame, and jealousy felt and energetic charge emitted that is still lingering. I am not surprised that so many of the psychics are confused, because with twinflames who exist and operate on a higher vibrational plane, it is quite challenging to connect unless you are yourself a twinflame. These two are destined to do great things together and as individuals. There will be challenges, obstacles and naysayers, and they are ready to face it together as a team, because that is the pact they made with each other in a past life and have renewed in this life walk. Those waiting for it to end shouldn’t hold their breaths. I admit that I have been unsure about Meghan from the beginning. I read many comments from psychics who said she is insincere and calculated and some have said she would be exposed before the wedding. However this has not happened so it appears they were wrong. They are now married. Obviously I don’t know what will happen in the future but there is clearly something special about Meghan- she is not the most talented actress but she has been able to rise from being unknown to the heights that she wanted to reach. This cannot have been an easy feat. She is a person of colour, an actress, she didn’t come from the right background (in most people’s eyes) and she is not even Britisg but she still married into the Royal Family. She also must be a very strong and determined person to withstand all of the scrutiny she has received. Few people could do that. Another thing that is interesting is that it seems since the wedding I have read many more positive and revering comments about her. Before the wedding it seems many people disliked her. Perhaps over time more people will be won over by her. At the very least she is a force to be reckoned with and maybe she is destined for great things. I saw a few readings that said that the Royal Family really like her and they see her as a positive addition. I haven’t got that vibe but again I could be wrong and maybe she has won them over like she supposedly won over the Corgis! I see what you mean,but the reality is this wedding has happened and all i can do is hope that God blesses it.I Dont Meghan,but there is chance for lasting patnership let it. I am watching the wedding and I can tell you there is something wrong on Harry’ s face… He seems stressed or sad, emotionally in a turmoil… We can read him like in a book. Will he feel the burden of being married? Kinda rude how she did not SEE if her father was ok. She just texted him. I agree w/ SusanK, PH seems to be lost & in my opinion desperate for a change that can provide him with stability, respect & approval from his loved ones & the world. Unfortunately I doubt MM is the right person to help him. In the contrary, I think, once married, he will be bombarded with challenges & conflicts having to choose between siding with his family or MM. Only God knows what is going to happen i just hope he finds happiness (keep Princes Diana is happy) and MM does too. Everyone deserves to be happy. My reaction was similar to when I saw Diana out and about with D. Fayed. I see Harry as someone who is lost, wanting to find someone who can ‘complete’ him, etc. his tendency to rebel, go against the norm. Lyndsay, your comments via Spirit are interesting, regarding Harry’s soul mate..
a quiet girl, not one to seek the limelight, etc., as I’ve had the same “sensings”. told her it was “too late” to do so. The sister added that the tea towels were already in place! I say it’s never to late to make the right decision. father’s shennanigans.. And, rightly so. There’s just too many red flags here to ignore. Something I’ve noticed.. about the date of May 19th– it was also the same date when Anne Boleyn was beheaded. Word on the grape vine is that her father had a heart attack about six days ago and might be backing out of the wedding entirely do to stress over the heart attack and supposidly humiliation over getting caught selling photos to the media. Hmmm….seems like a legit reason to postpone to me! Such a sad situation. I hope it works out in the long run. Time will only tell! Hey has everyone seen the tabloids over the past few days with Meghan’s family? Lyndsay are you be able to give us an update on Meghan and harry and where their relationship stands leading up to the wedding this Saturday? But Prince harry will not listen of course… So, interesting to see that as secret things are starting to emerge. In Buddhism we say this: Quote “There are 3 things that cannot be long hidden: The sun, the moon and the truth…” . Hi Lyndsay please please please who is going to be the husband of the other white girl ? Hey guys! Have you read the news about Prince Phillip? Well I think Lyndsay were right. There is a legitimate reason for the wedding of PH and meghan not to take place. Though I sincerely hope for the fast recovery of Prince Phillip. I watched one video of psychic from france and she said that their marriage will postpone cause one of eldest member in royal familly will be died during the ceremony and they will cancel the wedding and postpone it in few months. So, i don’t know she refers about prince philip or not or maybe just coincidence. It makes you wonder where some psychics channel their information from. There are different outcomes, could it be possible their seeing it from different timelines…so potentially there is a reality of PH going a head and marrying MM and in the other they decide to split and go their separate ways; hence different timelines.. But they haven’t postponed the wedding though, have they? Isabelle, Further to your comment of Wednesday, 11 April 2018, to all. Yes, you are correct, to the current date of Monday, 14 May, they (i.e. Prince Harry and Meghan Markle) have not postponed their wedding, which is still scheduled to take place on Saturday, 19 May. Yeah, I’ve seen that too on another discussion site. There are people defending MM. Like I said before nothing will change Henry’s mind about MM. He is in the honeymoon stage. I think when it’s over he will see a side of her that people have been mentioning, There has to be some truths to what people are saying, They can’t JUST be bitter. It will be an interesting 5-12 years. @ks MM must be very charming if she can get the ring from Henry, who’s had more girlfriends than he cares to admit. The first time I saw them together I had to ask myself what he saw. She’s not ugly. She has to be different than the other women he’s dated. Now the bitter part. I take the things ppl say with a pinch a salt. I don’t know either to say otherwise. Which I find funny because how do the ppl who bat for MM know she is a good person? Taken that in. I think MM is great for him. For now. I feel like Henry has always been a wild child. The engagement came fast but that seems like true form for him. MM is perfect because she’s mature and been through it. She also loves the limelight. It’s just sad because I do see similar fate to his parents. With marriage to MM, according to predictions,will H decides the desteny of his soul mate in living a life without a true love? How can love be condemned in this way? And what about energies, light friends, guardian angels strive for the happiness and fate of two people who are predestined to be together? Guys have you read the article on twitter about Meghan? They said that the “royal wedding” is her THIRD marriage! Have you read that? I’ve been watching all the videos you all recommended. I see that Dane Hart has a new video up. Any of you watched it? She states that MM would be prosperous if a divorce occurs. No surprise there with the connections she will make whilst married to Henry. I do not know if it’s readers feeding off each other but they all feel this relationship is doomed from the start and it will end as soon as it started. It’s quite sad but I can’t feel for either party. Judging by what I’ve read, people in Henry’s life has warned him yet he chooses to be stubborn to prove them wrong. Didi just posted on the previous prediction the the women that matches Lyndasy’s description may be newly divorced Onasis. Didi said she and Harry dated back in 2016. WOW, wouldn’t that be a great match! Many years ago the tumblr speaks of Harry’s twinflame and has been spoken and repeated many times by several psychics the woman spiritually destined to him, is not royal or celebrity, she is a normal woman who does not like of lights and cameras. There’s a big possibility that she’s a foreigner, and she’s totally new to H, so they would never meet before the definitive meeting, which would happen after MM (Harry’s carmic bond). That’s all I know. I rather like Dane Hart too! Find her voice very calming and gentle, and the wording she uses is picturesque. I love her voice too. I was the winner of the free reading and she did an excellent one, although I didn’t give her any details on purpose. I’m quite impressed with the detailed readings in general. I don’t think you understand what I’m trying to say about her speaking voice. She talks as if there is a period after each word. I’ve been reading with psychics for many years, and some readers are just better at delivering the message. I’m sure she’s a good reader, but she.talks.like.this. Kirsten Langston is pretty good on YouTube. She has several readings on the couple, but the wedding chart with an astrologer reading is good. Check her out! Hannah, That’s because a good reader has to read the cards and listen to spirit. If she is always speaking she could do neither. A good reader must pause and listen, then relate the message. If you notice Lyndsay has already spoken to spirit and is now relating in a type of reporting what spirit has said. Everyone has to find a reader they resonate with. Just wanted you to know why a good reader does that. I’m sure the reader is very sweet, but her speech doesn’t flow naturally. She speaks, stop, speaks, stop, etc. It just sounds very weird and abrupt. Hanna, Dane Hart is really very sweet. Most people I’ve spoken to think her voice is soothing. Maybe it’s her accent you don’t like, or you need to speed up the video a bit. Anyway, is seems she is not the reader for you and you need to find someone else. Good luck. Now that we know PH is inevitably marrying MM, what can you tell us about how many children they will have and how the relationship will be? Everyone has established that this relationship wont last but then who do see MM destined to be with afterwards? Surely there is one out there for her that’s compatible in the same way that PH was more suited to that mystery girl he was meant to hook up with! PH and MM’s alliance seems more like a karmic contract. They get what they need from each other and then move one…..
Now that we know PH is inevitably marrying MM, what can you tell us about how many children they will have and how the relationship will be. Everyone has established that this relationship wont last but then who do see MM destined to be with afterwards? Surely there is one out there for her that’s compatible in the same way that PH was more suited to that mystery girl he was meant to hook up with! PH and MM’s alliance seems more like a karmic contract. You said we don’t watch royal wedding this year? What happen and what about the girl who will meet him? I can’t listen to Dane Hart. The way she speaks irks me. I just watched one of Dane Hart’s videos (the most recent one) , after you guys mentioned her. Dane was saying that although the marriage will not last, MM comes out of the relationship very prosperous and even finds love. It got me thinking again. MM seems like someone who is very ‘lucky,’ charmed even. I think it was mentioned in the comments somewhere that MM was destined to live a very normal life and not have wealth but that is not how it appears/ seems to be unravelling at all. She is engaged to a British Prince and she is now a household name. She appears to be a very determined person who will do whatever it takes to achieve her goals. She doesn’t appear to be genuine or loyal and I don’t know all the things that she has done to get to where she is. I also know she is not popular but all of these things are appearing to be irrelevant. When I hear people like Lyndsay and Dane saying she has a successful future, that does seem more in line with whats happening. I think Dane described her as a ‘force to be reckoned with’ and like her or loathe her, this appears to be the truth. The public may not like people but she always seems to find powerful people in high places who do. YOU BETTER HURRY UP. MAY 19 IS LESS THEN TWO MONTHS AWAY! You know the wedding just might be postponed because Prince Philip is 96 and is not well. If something happens to him The Queen will be devistated, as will all of the U.K. God does work in mysterious ways. Right, Lyndsay? What happened …. what about the postponing of the wedding ….BTW, MM prepared to be a new sacrifice, her interview in 1990 about washing soap …. everything was planning very well about this woman … you should watch the videos of Zachary K Hubbard and see what will happen. He said everything will be around Diana’s death …. BTW, she makes friendships with wealthy and rich people especially Jewish people who have money and power like Misha Nonoo, and some of designers …. Will you elaborate a bit more on their future? How long before the divorce, how many kids, how does the BRF really feel, did MM have a “fake” pregnancy scare that prompted an engagement over roast chicken? If they divorce, and his true soulmate marries anonther man, will a better woman come along? Thank you Lyndsay for the update. I’m just wondering if your spirit spoke to Princess Diana? Is Princess Diana happy with this? I spoke with Princess Diana in the first psychic prediction spirit gave me for Prince Harry & Meghan Markle, Princess Diana has chosen the other girl for Harry as she of course wants him to have a happy and long lasting marriage. I think it is safe to say that they are getting married. I’m sorry to the fans but I agree. I think it would be a repeat of Charles and Diana. Going off if they are having arguments so early. Besides marrying for love, I think that he has ppl in his life that wished he picked someone else. I believe he is also the stubborn type who has to learn lessons the hard way. If they do get a divorce…how will their life be after? We all know he would be set regardless. I just feel like she would be to. Until ppl stop caring that she is an ex of his. If anything, does your spirit say anything in that regard? I do believe I am the girl that the spirit said is made for Harry. I dunno what I just feel it. We have something in common especially in family matters. I am hoping to meet harry in the nearest future. I still think something will happen to prevent this from going forward…. Will this be a split before or after children? So, what about the postponing of the wedding with them providing a legitimate reason for the decision, as predicted before? Thanks Lyndsay for the update,How sad ,I really hoped Harry would see the light before the wedding took place but I guess you have to let some people learn from their own mistakes i just hope there is no kids involved when they do split it does make me wonder though will Harry ever meet this girl who’s his soulmate after the wedding takes place ?